home / Multimedia / The Holy Land in news / The project “Bethlehem Flour”, in favor of the women of ..
“I am a mother, and for the whole day I am busy with my children, cleaning and housekeeping, and this activity gives a new dimension to my time. Now I am happy to work and to be an artist making hand-made goods.” These are the words of Ameera, after having seen the first results of the new production begun due to the “Bethlehem Flour” project, which was born from the desire to support Christian families in Bethlehem and encourage them to remain in the Holy Land, in a situation deeply marked by conflict and by growing difficulties of coexistence among the different cultures. The project, which was developed as part of the overall project 196/14 WOMEN, YOUNG PEOPLE AND THE ELDERLY. To support the weakest of Bethlehem” co-financed by the 8×1000 COMMITTEE of the Italian Episcopal Conference, is aimed at the women of Bethlehem, involving them in a work activity focused on local crafts with the objecting of forming a small cooperative for production. Beginning in October 2015, the staff of Association pro Terra Sancta met with the coordinators of this initiative, Gloria Nasser, a social worker at the St. Joseph’s School in Bethlehem, and Marta Ferrari, an Italian teacher with the Franciscan friars, to identify persons interested in participating in the activities of the project. After having narrowed down the selection to five local women particularly interested and motivated to participate, the team began to meet regularly in the Association’s offices to share ideas and proposals, and to define in precise terms the theme of the project, its characteristics and mode of implementation. The different talents and strengths of the participating women, who demonstrated an inventive spirit and a great desire to succeed, quickly emerged; after carrying out a market analysis, various proposals were put forward in order to find the best project for moving to the second phase. 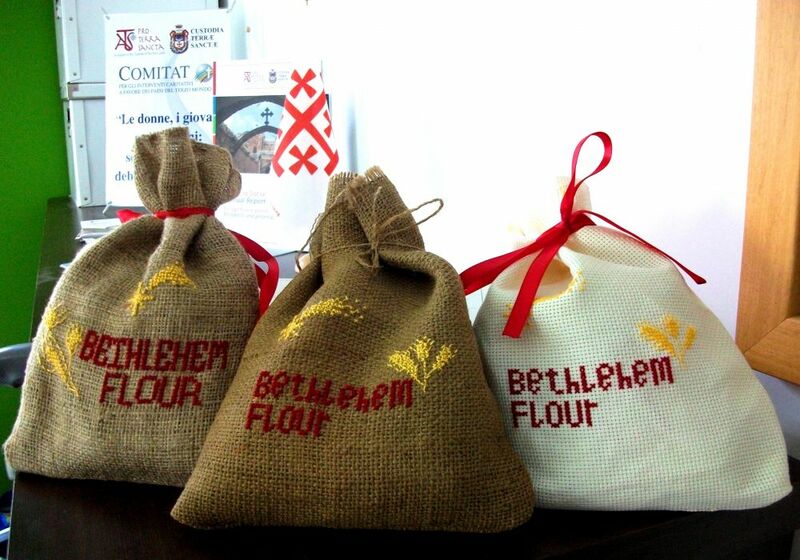 The focus has been primarily on the enhancement of local crafts and on the specificity of a place having the significance of Bethlehem, in order to define, in January of this year, the final product: a bag completely produced by the participants with the project logo and title embroidered by hand. The bag will contain 500 grams of flour from Beit Sahour, the place where the biblical fields of Boaz cited in the Book of Ruth are found. With this mixture, using the recipe provided in the leaflet attached to the string closure of the bag, one can prepare the pita bread typical of Bethlehem. After the production of the final models, in April actual production began, which will result in the women producing around 200 bags during the summer, to be offered for sale to coincide with the peak arrival of tour groups and pilgrims. Interviewed about this, Gloria, the coordinator, said she was “very happy with this project that, with great willingness on the part of everyone involved, aims to support our families in Bethlehem”, and sees slowly growing, thanks to the efforts made so far, “an important opportunity for employment for the women of our city”. 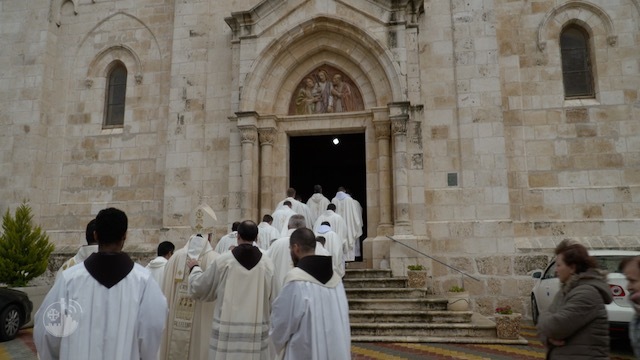 Find out more about our activities in Bethlehem!